We design and specify your geothermal system throughout south central Wisconsin in a way that assures great energy efficiency and amazingly low operating costs to heat and cool your home. 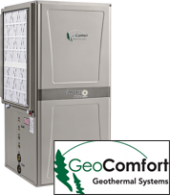 You may be interested in how geothermal energy is a pretty amazing technology where the operation of your home’s heating and cooling system exchanges temperatures with the relatively moderate and consistent temperatures of the earth. Amazing it is, (and convenient!) that in the winter the system adds warmth to your home and in the summer, the system reverses to remove warmth to leave you comfortably cool. Throughout south central Wisconsin, our customers often tell us that they notice that the air is more pleasant too.